Placencia Village  is at the southern tip of the resort peninsula of Placencia in Belize. Flying from Belize City with Tropic or Maya Island Air is easiest. You can also ride a school bus into Placencia from Belize City; 4-6 hours. The road from Southern Highway to the village is rough and dusty - alternately take the bus past Placencia road to Independence and Mango Creek in Stann Creek and then the Hokey Pokey water taxi across to Placencia. Placencia Shuttle Service is Clean, Comfortable and Air-condition that is well suited to transfer up to 8 passengers. Base in Placencia, we are fully capable of transferring you safely to or from destinations such as San Ignacio, Belize International Airport PGIA, and Belize City Water Taxi. We do pick-up or drop-off at any resort on the Placencia Peninsula. Valdez Shuttle Service offers affordable ground shuttle transfers from San Ignacio, Belize International Airport or Belize City to Placencia Village. Valdez Shuttle Service provides these comfortable shuttle service to Placencia in Air-conditioned vehicles. In addition, they keep their vehicles cleaned and well maintained ready to provide his door to door shuttle service. (BASS) Belize Airport Shuttle Service offers both ground and air transportation services to Placencia Village. With BASS you can book your Shuttle or Flight to Placencia village from any of the following destinations: Belize International Airport, San Ignacio, Belize City, Orangewalk, Corozal, Flores, Ambergris Caye, or Belmopan to name a few. In addition, Belize Airport Shuttle Service provides a door to door ground shuttle service from these destinations as well. William Hofman Shuttle Service is the most recommended private transportation service in the country. His shuttle service is always on time and communication to arrange your transfers great. Book one-way or round trip to Placencia and you will find that the transfer is apart of your vacation. Just wear comfortable shoes. There are taxis, but you shouldn't need them except perhaps to/from the airstrip, which is only 10 minutes from town. "The Sidewalk" is a concrete pedestrian-only path that runs most of the length of the village, ending at the seashore. It is interesting to walk up and down and there are many businesses of all types along the way. Rent a kayak and snoop around the lagoon. Manatees, crocodiles, dolphins and birds. Chill out on the beach. Take a sailing trip with one of the sailing charters in town. Go fly fishing. Take an eco-tour and go snorkeling with D-tourz or Nite Wind. Cockscomb Jaguar Sanctuary, Monkey River, snorkeling at Silk Caye and Laughingbird Caye. For Scuba Diving or snorkeling check out Splash Dive. They have a new dive center and the only scuba equipment store in the southern half of Belize, located at the new marina across from Chabil Mar. They have 6 dive/fishing boats ranging from 25 feet to a new 46 foot Newton Custom Dive Boat. They also have an office in town where you can sign up for diving and snorkeling or for inland adventure tours.[]. On the Hook: Fishing Charters offers a variety of fishing adventures and ocean tours. Trolling to spin casting or traditional hand line fishing along with snorkeling, or just a day on an island can all be done. Nauti by Nature: Fishing Charters Where you could customize your fishing vacation and various types of fishing, snorkeling, island hopping or even add camping are possible. Snorkeling: day trip in Placencia Coral Atoll and the open ocean, while tour the reef is a day while spent with you tour with Nautical Adventures Belize. The Reef Looker is a Glass Bottom Boat that is perfect for viewing the Reef and all its inhabitants from the comfort of a boat. Enjoy a day at the Laughingbird Caye National Park a protected area perfect for Snorkeling and Diving enthuses. Wildside: Placencia Adventure Tours Snorkeling, Scuba Diving and Lionfish hunting can be a part of your day trip from Placencia with Conrad in his crew. Visit to the now famous turtle ally at the silk cayes is a great place to swim with these sea creator. Jungle Tours: Belizeing Adventure & Nature Travel conducts inland tours from Placencia to Archaeological Sites, Caving, Nature Trials, Zip Lining, Cultural Tours, and much more. You can find quite a bit of good food and a few places for great food. A few suggestions would be Barefoot Beach Bar for burgers, smoked fish, smoked chicken and cold beer. De Tatch is the best place for local food. Seafood, chicken and daily specials reasonable. Belikin Beer (they also make a decent stout), or One Barrel rum, both products of Belize. The local coconut rum is surprisingly good, and happy hour at the Barefoot Beach Bar (6-7pm) is the best place to be. Accommodation ranges from huts with shared "bathroom" to cabanas on the beach to guest houses to resorts. The larger resorts are north of the airstrip in Seine Bight and Maya Beach, and not really part of the village. 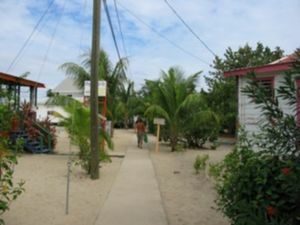 Within the village, there are several higher end places to stay, including the micro resort Caribbean Beach Cabanas, Belizean Nirvana, and Sunset Point. Rated #1 in the village(Tripadvisor Specialty Lodging), adults only (18+), luxury cabanas, beachfront. Steps to town, the only boutique resort located walking distance to everything in the village. Perfect for honeymoons, anniversaries, or adventure seekers. You can drink the water; it's plumbed in from an artesian well on the mainland. Cockscomb Basin Wildlife Preserve. Its back on the mainland in Stann Creek and well worth the effort to get there. Try D-Tourz [Doyle Gardiner] for informative and organized "adventure of a lifetime". Monkey River Town. Several outfits can hook you up with a boat trip south for manatee and howler monkey watching. This page was last edited on 18 August 2018, at 12:23.